So, I’ve been brainstorming on a new piece of equipment. This is the EMF pump which is designed to generate a EMF field in a small area. The general theory is that it can potentially feed a spirit presence allow for enough energy to help aide in communication (either in manifestation or commonly used to help with EVP capture). Seems like all of these devices I’m generally skeptical on, but I’m willing to try anything. I like the idea of detecting EMF fields (moving) as a potential indicator of a presence, but the idea using this energy (ie: from batteries, etc) has always been hard for me to swallow. It’s one thing to be in abandoned building that is completely void of power, but to use this theory in all areas is rough for me. Seems like there is power EVERYWHERE in a functional building, including EMF. EMF can be found in anything with coils and transformers or with exposed wiring. Examples would include TVs, microwave ovens, light switches and outlets, fans, etc. So, if any of you have had any experience with a EMF pump, let me know what you think… also would love to know how you built it. My plan is quite simple. I’ll be using one or two electric fan motors (basically DC electric motor), which I’ll plug into a power source. I’ll also be attaching some rare earth magnets on the axel of the motor (removing the fan portion) and surrounding that with a coil, creating a electric generator. So, this will be two magnetic fields be generated. I’ll be running to Good Will to see if I can find some goods [electric fans, microwave oven]. I want to tear apart the microwave to get the transformer to use the copper to create my coil. I’ll be ordering some magnets today… so we’ll see how it all goes. I mentioned this a while back that I was going to make a modification to the Radio Shack Pocket Radio (#12-469) to allow it to sweep uninterrupted through the AM or FM bands. This can be used in conjunction with EVP sessions. Personally, I’m not sold on this technique, but wanted to give it a shot regardless. Here is the radio you need. I’ve heard they’re not selling this anymore? If this is true, you can many tutorials on other various Shack hack ghost boxes types. The concept is the same for all, removing the ‘mute’ pin. Okay, here is where I add my standard disclaimer. I’m not responsible for any injury or loss of equipment when attempting this modification. Do this at your own risk! The first step is to remove the three screws from the rear including the one in the battery compartment. Once you’ve removed the screws you’ll see the PCB (Printed Circuit Board). Now this circuit board is attached to another circuit board below it. You’ll need to remove two more screws that connect the circuit boards to each other. They’re connected with a set of connector pins. You’ll be able to separate the circuit boards, but be careful! Now flip the circuit board you removed over and you’ll see the series of pins. They’re all labeled, and what you need to do is to clip the MUTE pin. Triple check that you’ve identified the correct pin. Now with a pair of wire cutters clip the pin as close to the circuit board as possible. I circled the pin for reference. What this will do is prevent the radio to lock on a channel during scanning mode. Now reverse the steps, gently reattach the circuit board to the other. Screw in the two screws securing the circuit board. Attach the cover and screw in the three screws. To test, add batteries and hold down the center button. The channels should begin scan, but never stop. I also found this video showing the same unit I used. I’m very excited about 2010. The group which I’m a member of, Tortured Souls Investigations, has some great investigations lined up for Spring 2010, which the potential of more local locations. This weekend we kick off 2010 with a great location with lots of local history, so I can’t wait! I have some plans for new ‘gadgets’ for 2010 as well. Side note, I hate it when people call them ‘gadgets’ or ‘toys’. Can’t we call it equipment?? Not sure why you don’t hear them be referred as ‘toys’ on TAPS or Ghost Lab, etc. Maybe I need to make them to look more like ‘equipment’. Heavy, metal, something with ‘authority’ might be needed. EMF detectors that you need to wheel in with a hand truck.. no we’re talking! Seriously, I’m interested in making a EMF pump this year as well as some better ghost beacons and illuminators. Along with building some new projects, I’m starting to assemble a little wish list of equipment to purchase. Mel Meters, Data Recorders, etc. The last 107.5 ghost hunt was Thursday (I’ll be writing something about that later), and we did have some interesting things happen throughout the night. One of the oddest things was related to KII hits during a live EVP session in one of the basement rooms. I’ve used the KII EMF meter on a lot of recent investigations with not a lot happening with it. I did have a unexplained spike at Rankin Hall, but other than that, they’ve all been associated with areas with high EMF (circuit boxes, etc). During that EVP session we did experience flickering and spikes, and we tried to debunk the situation. We took a base of EMF in the area, and all was low, but we were reminded how cell phones could trigger the KII. We did a few tests, and one of the things that we noticed during the live EVP session (which was done via cellphone) was that that the lights would flicker as the investigator would talk in the phone. We were able to see how ringing could affect the KII with a phone being closer than 2′ away. Today, I wanted to do some research on another EMF gauge (Mel 8704R) and found a great video demonstrating the sensitivity the KII has with phones and 2-way walkies. So I’ve been kicking around the idea of building a ‘ghost beacon‘. The concept is something that flashes in the IR and UV light spectrum, that might be able to attract some spirit activity. Does this work? Who knows, but it sounded fun and nerdy, so I’m all over it. I was looking around for various schematics on how to do this, but I stumbled across a great kit at BG Micro, that I thought would be perfect. The kit was the Tiny Cylon kit. Normally, this uses 5 small red LEDs and a 555 IC chip pre-programmed to display various light patterns. I thought it would be cool to replace some of the LEDs with IR and UV LEDs. The kit comes non-assembled (basically a circuit board, resister, switch, IC and 5 red LEDs). I also purchased a few 940nm/50 degree LEDs and a few T1-3/4 UV LEDs. The UVs are a bit pricey at $1.49 ea, but these IRs are on .20 ea. I would probably try ones with greater degree though. The 940nm make it completely invisible to the human eye though. The kit is very easy to assemble, just add the components and start soldering! The kit comes with a battery pack (3 AAA batteries) with postive/negative leads so you need to solder those as well. I initially had some trouble powering the unit. Doing a quick check with my volt meter, I noticed that something was ‘off’ with my incoming power supply. Re-seating the batteries in this case fixed the problem. You can use the switch to change light modes. I believe there are 5 or 6 different modes. Please let me know what you think, or if you have any suggestions, tips, etc. You can also get a hold of me on Twitter now as well! So a while ago, I posted a how-to on building a simple IR (infrared) illuminator using a flashlight and colored gels. This is a great, easy way to add additional infrared light to your night shot cameras. 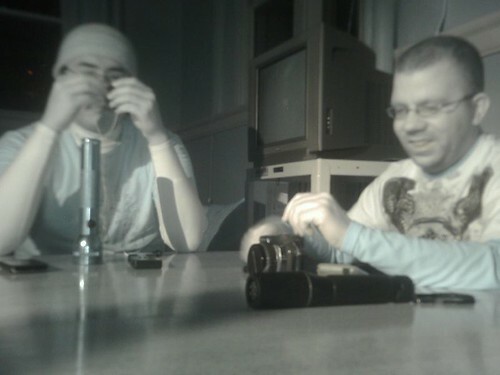 Recently, I was at a investigation at Rankin Hall, and this was my first test of these IR illuminators. Overall, they worked great, but I felt that the light beam was too focused and it created a large spot on the wall when pointed to it. I wanted to ‘wash’ that out and cause more of a ‘flood’ effect. Doing some brainstorming and asking other nerdy friends, a friend came up with the idea of using a fluorescent light cover. I thought this was absolutely brilliant idea, since the flood lights had ‘nubbed’ surfaces causing the light to refract on multiple points on the surface. I went to Ace hardware and picked up a 2×4 sheet of this material (approximately $7) and took it home. Here are the steps I took to complete this project (this is starting with a functional IR illuminator). I laid the material on the floor and took apart my flashlight to use the reflector as a stencil. I used a utility knife to outline the reflector. There is a flat side and a nubby side. I scored the plastic on the flat side. Be careful with this material, it’s very brittle and can crack easily. Next, I used a Dremel tool with a cutting wheel to cut out a square around the circle. This will give you a more manageable piece to work with. Once that is out, you can cut on your score mark easier. Try not to damage the surface, and stay with in the outline. I used a sanding bit to smooth the edges, but a file would probably work as well. Next you lay the additional lens in the lens holder. It should be a sandwich. Refraction lens, gels and the actual lens. I kept the nubby side towards the light source. Here is what the light source looks like.. pretty cool! I wanted to show you the before and after conditions of the IR illuminator as well. These shots were taken with the IR converted digital camera, using the IR flashlight as the light source. Here is the shot without the refraction lense modification. As you can see, there is a intense center point. Sorry the photo is slightly blurry, the IR camera should have been on a tripod, since it’s still shooting in low light, but I just wanted to illustrate the ‘spot’. Next is with the modification. You lose a bit of distance, but the area is more covered with IR light. The beauty with this modification, if you need a beam, you just remove the refraction lense. Very quick. So I was able to attend a interesting event here in Missoula. 107.5FM are having a ‘ghost hunt’ every Thursday for the month of October. Apparently, the first week was a ghost hunt ‘simulation’, I wasn’t aware of this.. or what was involved, but the public was invited and were participating in a contest to attend a ‘real’ ghost hunt the following Thursday(s). I was contacted by my group (Tortured Souls Investigation – TSI) to see if I would be able to attend the upcoming ghost hunt. 107.5 was planning to have two paranormal investigation teams (TSI and GIG – Girls Investigation Ghosts) take the winners from last weeks simulation. The crowd consisted of about 20 people (which is large for a investigation in my opinion). Going into this I was VERY weary of participating. I was worried it was going to be too much of a media circus and I was also unsure if the people involved would take this seriously, or mock our efforts. There was media and there was a lot of hype involved, but I was really impressed with the participants. Quickly it was obvious that the people who were there were into it.. with respect and seriousness. Rankin Hall consists of three floors and is one of the oldest buildings on the University of Montana campus. The first team had the main floor and the upper floor. The second team (TSI) started in the basement. After a hour and half or so, the teams swapped locations. KPAX, one of the local news stations, also attended and stayed for the majority of the hunt as well. I was particularly excited to use a few pieces of new equipment. It was a great opportunity to use the GeoPhone, but we had no interesting results from it. I also used the Moultry game camera in hand-held mode. Normally, I use the game camera with stationed on a tri-pod, but wanted to give this a shot. I feel like I need to work on my aim a bit, and be just touch more still. I was also able to use my digital camera converted to IR during low light. I had to use my flashlight IR illuminators to light the room prior to shooting any photos. I noticed that my flashlights are too focused, and I need to figure out how to disperse the light a bit and create a more wash/flood. If anyone has any suggestions on how to do this.. please let me know. I was hoping to use the ShackHack ghost box, but the opportunity did not present itself during this investigation, but it could be possible for next week’s hunt. Overall, the Rankin Hall investigation provided low activity. There seems to have been a few personal experiences, but no real ‘hard’ evidence, but it was great to make some new local friends interested in the paranormal. You can see photos from the Moultry game camera and the digital still IR shots in my Flickr Gallery. My friend Andy commented on my GeoPhone project and mentioned that the sensor and kit are unavailable currently. I’ve been curious how that sensor actually works. I knew there was a magnet and it felt ‘suspended’ since moving it makes a noticeable ‘clicking’ sound. I found this cool diagram describing how that sensor works. Looks pretty simple, I wonder how hard it would be to make.. I’m guessing the tough part is getting the right frequency.